Quigualtam or Quilgualtanqui was a powerful Native American Plaquemine culture polity encountered in 1542-1543 by the Hernando de Soto expedition. The capital of the polity and its chieftain also bore the same name; although neither the chief nor his settlements were ever visited in person by the expedition. Their encounters consisted of messages sent by runners and a three-day long canoe battle on the Mississippi River. Multiple archaeological cultures, archaeological sites, and protohistoric and early historic period Native American groups have been proposed by historians and archaeologists to identify the polity, but their identity will probably never be known with any degree of certainty. Not finding the precious metals and gems the Europeans desired, the expedition left eastern Arkansas and headed west across central Arkansas and into the Ozark Mountains in their search for riches. Finding nothing they considered of value and contending with considerable native resistance; de Soto and his men returned to the Mississippi River, where they found the maize-rich polities of Guachoya and Anilco (thought by some archaeologists and historians to be the Menard-Hodges Site in modern-day Arkansas County, Arkansas). After encountering resistance from Anilco and entreaties of alliance from their traditional enemies, the Guachoya; de Soto made his headquarters at Guachoya. Other scholars have proposed the Glass Site and Emerald Mound as native territories. The Glass Site is on the flood plain between the Mississippi River and the Natchez Bluffs, approximately 9.5 kilometres (5.9 mi) south of modern Vicksburg. It was on the northern edge of the Emerald Phase (1500 – 1680) of the protohistoric Natchez chiefdom. During this period, its capital was located at the massive Emerald Mound near modern-day Stanton, Mississippi. These two sites were the only major ceremonial centers on this stretch of the Mississippi River occupied during the protohistoric period from 1500 to 1650 CE. Since the Spaniards never made it ashore to leave archaeological evidence of contact with these two groups, their exact identity will probably never be determined with certainty. In the meantime native peoples of the region suffered from epidemics of infectious disease. They contracted these from members of the de Soto expedition, among whom the diseases were endemic, and indirectly from other Native Americans who had contact with European traders on the Gulf coast. The Spaniards' technique of using local rivalries to their advantage had upset the delicate political balance between native groups, who had existed in a state of low-level endemic warfare between polities for generations. In addition, a series of disastrous multi-year droughts spanned the latter half of the 16th century. ^ a b Young, Gloria A.; Hoffman, Michael P. (1993). Expedition of Hernando de Soto West of the Mississippi, 1541-1543: Symposia. University of Arkansas Press. ^ a b c d Hudson, Charles M. (1997). Knights of Spain, Warriors of the Sun. University of Georgia Press. pp. 341–351. ^ Gentleman of Elvas (1557). The Expedition of HERNANDO DE SOTO in southeastern North America, 1539-1543 (PDF). National Humanities Center. p. 12. ^ Smith, Marvin T. (1994). 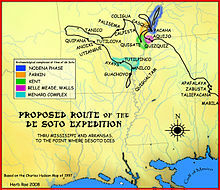 "The Hernando de Soto Expedition". In Charles, Hudson; Chaves, Tesser Carmen (eds.). The Forgotten Centuries-Indians and Europeans in the American South 1521 to 1704. University of Georgia Press. ^ a b c Hudson, Charles M. (1997). Knights of Spain, Warriors of the Sun. University of Georgia Press. pp. 380–392. ^ a b Downs, Lauren Elizabeth (2012). The Glass Site (22Wr502): An investigation of Plaquemine culture architecture, occupation, and interaction in the northern portion of the Natchez Bluffs region, Mississippi (PDF) (Doctoral thesis). The University of Alabama, ProQuest Dissertations Publishing. Retrieved 2018-01-27. ^ a b James F Barnett, Director Mississippi Department of History and Archives. The Natchez Indians. pp. 12–14. ^ a b Jeter, Marvin D. (2007). "Outer limits of Plaquemine culture". In Rees, Mark A.; Livingood, Patrick C. (eds.). Plaquemine Archaeology. University of Alabama Press. pp. 192–194. ^ a b Morris, Christoper (2012). The Big Muddy: An Environmental History of the Mississippi and Its Peoples from Hernando de Soto to Hurricane Katrina. Oxford University Press. ^ Young, Gloria A.; Hoffman, Michael P. (1993). Expedition of Hernando de Soto West of the Mississippi, 1541-1543: Symposia. University of Arkansas Press. p. 208. ^ Brain, Jeffrey P. (1990). The Tunica-Biloxi. Chelsea House Publishers. ISBN 978-1-55546-731-9. ^ "ON THE TUNICA TRAIL-Quizquiz". Retrieved 2018-01-30.